Summary The 'Energiepark West' building is used by three solar companies: AKS DOMA Solartechnik, who ownes the building as well and is a producer of solar thermal building integrated systems; the Freiburg based S.A.G. 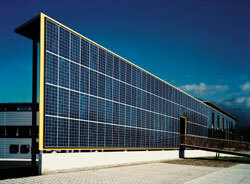 Solarstrom GmbH; and stromaufwärts Photovoltaik GmbH, a PV planning, selling and installing company. With the office and production building 'Energiepark West' the engeneers put their own vision into reality: the building shell carries a 17.16 kWp PV-facade, made from poly crystalline Kyocera standard modules and a 45 kWp roof plant, made from mono crystalline standard PV-modules, produced by Solarfabrik. Furthermore the building is equipped with an facade integrated thermal collector system.